I remember one of my friends in college, who had one of the most alive smiles I’d ever seen, and pretty, sparkling eyes, and such a cheerful personality that just being around her had the effect of hearing the soothing sound of a stream bubbling through the rocks and trees. Her laugh was merry and happy, her hair was shiny, and she had the most beautiful skin you could imagine. I did not immediately concur with her advice or follow it, though. I did, on my last semester, take the required Wellness class where we had to log certain hours doing various aerobic activities, and I remember that the week I selected to try running, there was a heavy snowfall. I’m not sure why I later started running every day. Perhaps because it was the simplest form of exercise that I could fit into the smallest amount of time. (Maybe they told us in wellness class that you need a certain amount of aerobic activity each day, and running was only 23 min. whereas walking required a whole hour.) Perhaps it was because it helped me sleep during a time when sorrow and ill health kept me from sleeping. Anyway, it was really hard to get through it at first. I was hot, short of breath, my side hurt, and I didn’t think I could go on much longer. So, I alternated walking and running. Twenty steps walking, twenty steps running. Or one lap around our driveway running, and one walking. After a while, it got easier. In fact, after a while, I started to enjoy it. I felt a freedom in running down our country road at sunrise, lightweight and light of foot, floating along on the leash after our German Shepherd, watching the beautiful fields and trees surround and embrace me in the beauty of nature. It was peaceful, and I listened to the birdsongs and watched the flash of a bluebird dip past me in flight upwards to the wire where he joined his mate in perch. 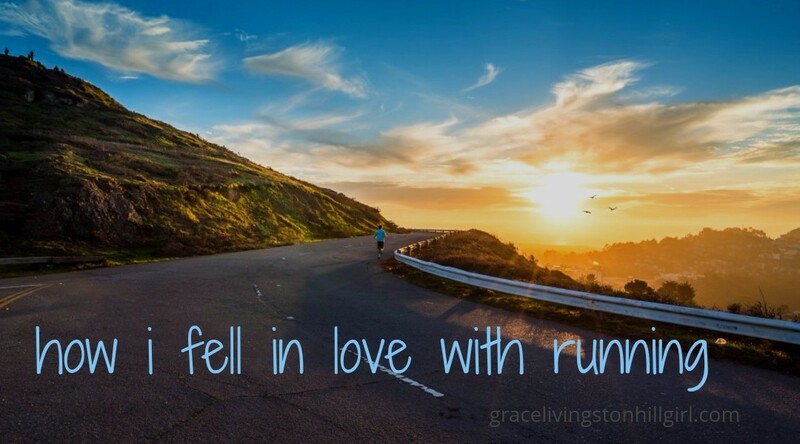 Running made me feel giddy and happy; it gave me a sweet taste in my mouth. It gave me my good health and kept me from getting sick, ever. I can understand that quote from Eric Liddell, “When I run, I feel God’s pleasure.” I haven’t seen the movie about him yet, Chariots of Fire, but I really want to, because I love playing the music on the piano, and I respect the story of Liddell. And do you know, my friend with the beautiful hair, she was right!! Running every day eased and soothed my pain during the time-of-the-month discomfort. So long as I went running each day, I hardly even noticed the time-of-the-month. One thing that is imperative, though, when you run, is to stay hydrated. If I don’t have a good quart or more of water in me, I Don’t Go Running. I have noticed, too, that when I run indoors on a treadmill, and the temperature is warmer, I become more quickly aware of that choking, stuffy feeling of “I NEED WATER NOW,” When I open the windows, though, that feeling is somewhat alleviated. Too, you need good shoes. I have a friend who was a track star in high school and university, and she said that New Balance shoes are what she prefers. I have found that New Balance shoes always fit me correctly, and, yes, I do like them. I especially like the fact that some of them are made in the USA. However, I am addicted to running so much that I will run in any shoes that are comfortable enough! !